How Scary is Disruptive Technology? CAMBRIDGE – The steady stream of improvements in driverless cars has convinced me that before too long the roads will be filled with cars and trucks operating without humans at the wheel. Likewise, I am convinced that the revolution in artificial intelligence will allow computers and robots to do many of the tasks that white-collar workers now do. A reduction in working hours per employee translates into quality-of-life improvements like longer vacations and longer weekends. Fewer working hours will also provide more opportunities for travel, eating out, and other activities that create jobs for service workers. The aging of the population will increase the need for service-sector employees in hospitals and nursing homes as well. The most important challenge for Berlin is the division between eastern and western Germany. The latest regional election results indicate that the German political system has started to fragment. The differences between Germany’s east and west are the most important challenge for the German political elite. The evolution of German politics will highly affect the European Union’s future, as Germany is the bloc’s de facto leader. • After unification, the east wasn’t fully integrated with the west. Different socio-economic dynamics shape the current political challenges and widen the gap between the political elite in Berlin and the rest of the country. • The east has never lost its militarism. People in the east and west have different expectations of leadership, as the east is still adapting to Western democracy and the market-based economy. • The current regional divisions are a product of Germany’s history. 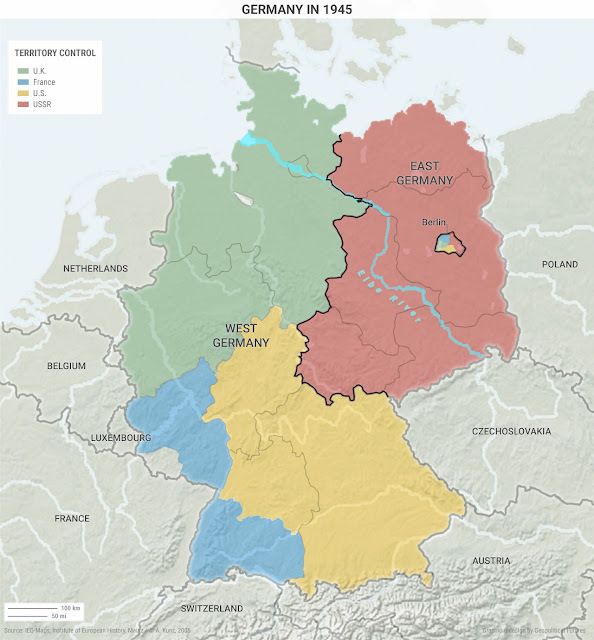 This includes the separation of the country into two states after World War II and the divisions between northeastern Prussia and the regions in the southwest. We are currently observing the fragmentation of the European Union, with Germany its de facto leader. Here, we will take a deeper look at Germany’s challenges because we consider them to be at the core of Europe’s challenges. The division between the eastern and western parts of Germany is the most important challenge for the leadership in Berlin. This divide will shape how Germany evolves and defines itself as a European power. However, the current regional disparity is a product of Germany’s past, including the separation of the country into two states during the Cold War. Therefore, for the purposes of this Deep Dive, when we speak of “the east,” we are referring to the regions that were part of East Germany, which was officially called the German Democratic Republic. “The west” refers to the regions of West Germany, officially the Federal Republic of Germany. The two were divided for 45 years until 1990. Prior to World War II, German society was divided along different lines. The northeast, dominated by Prussia, was different from the southwest, which encompassed in part the states that are currently called Bavaria, Baden-Württemberg and Rhineland-Palatinate. 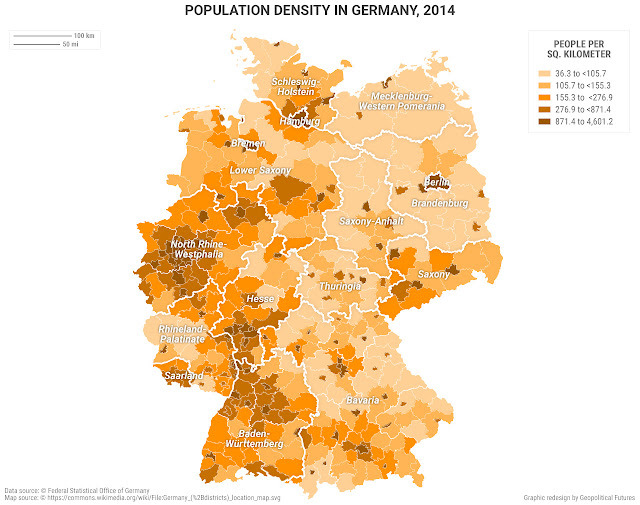 Geography has played the most important role in defining not only German politics and economics but also the multiple layers of differences within German society. Germany has experienced fragmentation throughout its history, and each time was a painful struggle for the country’s leadership and people. Berlin’s local elections have revealed two realities in German politics. They confirmed that the anti-immigration Alternative for Germany (AfD) party is visibly gaining ground at the national level. They also showed that other non-mainstream parties are becoming more popular and that the German political system is starting to fragment. This indicates, as elsewhere in the European Union, that the gap is widening between the elite and the electorate. Both trends started in the east and are now gaining ground in the west and point to a potential political crisis in Germany. Some blame the rise of populist movements in Germany on the country’s socio-economic problems and the refugee crisis. But, according to the election map, populism and nationalism have risen faster in the east than in the west. AfD’s greatest level of support is in the east, where it has been popular from the very beginning. 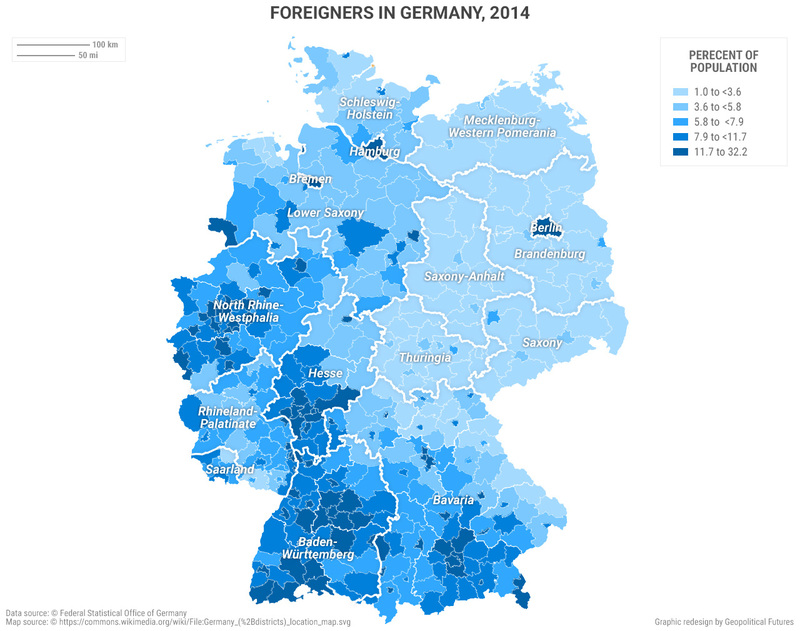 While the refugee crisis has clearly contributed to the rapid success of AfD at the national level, this doesn’t fully explain why it has been so popular in the east. The unification process in the early 1990s didn’t solve the existing divisions between East Germany and West Germany. The transition in the east from communism to capitalism is comparable to Eastern European countries’ transition process, in that the east has not yet completely integrated with the west. History also helps explain the current challenges Germany’s leadership is facing when dealing with the two regions’ differences. The east is still influenced by German militarism and struggles to adapt to democracy and the market economy. The west, in contrast, has had six decades of democracy and economic growth and has fully integrated into the Western system. Throughout the four decades between the end of World War II and the end of the Cold War, the west evolved differently than the east. At the end of the Cold War, the geographical borders were redrawn, but the divisions between the east and the west remain. The east needed to reinvent itself as it transitioned from a centrally planned economy to a market-based economy. The west was happy to have a larger workforce but soon discovered that it needed to invest in educating workers from the east, as they had different standards. At the same time, migration to the west has left the east with an unproductive workforce and inefficient industries. Even though the west poured a lot of money into reforms, the gray atmosphere of the eastern industrial cities was not completely erased. 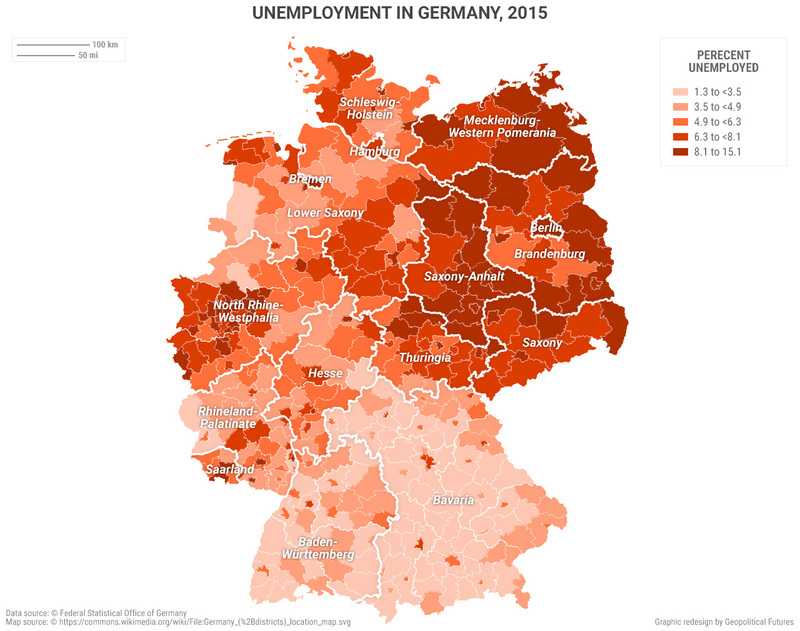 The east remains the poorest part of Germany, with a GDP about 25 percent lower than in the west, and it is suffering the most from the current EU crisis. If you travel from the west to the east, you will notice a difference in architecture and also society. The east resembles Eastern Europe more than it resembles western Germany. The open fields and large farms reflect the fact that agriculture is the largest contributor to GDP in the east. The reliance on agriculture also explains the low population density in the east. Leipzig and Dresden are the exceptions because they are university centers and most of the communist-era industries were concentrated there. Neighborhoods with gray apartment blocks, reminiscent of the Soviet era, surround the traditional German downtown core in cities in the east, while industrial sites are usually only partly functional. After unification in 1990, companies and factories in the east had to suddenly compete with their more advanced counterparts in the west and many went bankrupt. Unification also led to high unemployment rates in the east, which are currently at about 10 percent, double the rates in the west. Economic activity in the east has increased since the early 1990s as a result of governmental programs – subsidies and investment in infrastructure – mostly paid for by revenue generated in the west. Unlike the multicultural German towns in the west, eastern cities are inhabited mostly by people who are ethnically German. Young people often seek better-paying jobs by migrating to the west or elsewhere in Europe. The people living in the east see the refugee crisis as decreasing the number of job opportunities. It has been hard enough for people to reinvent themselves and survive capitalism after communism. Now, they see the refugee crisis as another challenge. In such an atmosphere, nostalgia is growing for the good old days under communism when everyone had a secure job and a home (or at least that was the perception). Socialism doesn’t have the same meaning in the east and west. The slogans of the Social Democratic Party (SPD) are different in both regions to accommodate the greater support for populism and the Left Party in the east. Former members of the Socialist Unity Party (which governed East Germany) have become supporters of the western version of socialism, sometimes without fully understanding the differences. At the same time, the east has seen growing support for nationalist and anti-immigration parties, like the National Democratic Party, AfD and PEGIDA. Tolerance for foreigners is very low in the east. Statistics show that there are more hate crimes in the east. A recent government report says that attacks on foreigners reached a peak in 2015, as incidents carried out by radicals from both sides of the political spectrum have increased. However, religion is not a factor. The large majority of the population of the east is not religious, while most of the west is Christian – predominantly Catholics and Protestants. In the east, dictatorship and authoritarianism shaped society for more than six decades. Throughout these years, the state’s constant control over private life gave people a different mentality than that of their western counterparts. People in the east expect more from their leaders – their problems need to be fixed from above, even if they do not expect the solution to be efficient. As is the case for most of Eastern Europe, the market economy and democracy are relatively new concepts. So is multiculturalism. They see no need to accommodate immigrants who pose a risk on multiple levels. The west has had the chance to get accustomed to democracy and the market economy since the 1950s and has already gone through the experience of accommodating migrants. The west understands that there is a cost, as well as a security risk, attached to receiving refugees and it is willing to absorb these costs to a greater extent than the east. To understand the way political fragmentation can affect Germany and Europe today, we need to look at the way politics developed in the east and west prior to World War II, as well as in East Germany and West Germany during the Cold War. These factors have built the divisions that the current leadership in Berlin is struggling to manage. At the end of World War II, the Allies decided to dissolve Prussia. Historically, the core of Prussia was East Germany. It was not Prussian culture but Prussian governance and its political model that allowed fascism. 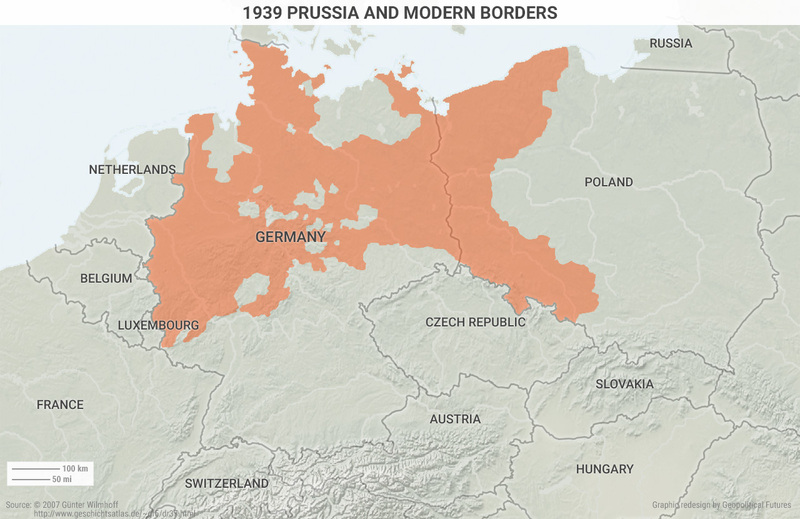 In the late 19th and early 20th centuries, external powers viewed Prussia positively. The state, founded in 1871, was seen as the best outcome of Germany’s historical evolution, a model for rational administration and economic progress. The Prussian state was perceived to be the liberator of Protestant Germany from the Habsburg Empire and Bonapartist French influence. Prussia’s efficient administration and geography were largely responsible for the fact that Germany didn’t go through the transformational processes that France, the U.K. and the Netherlands had gone through in the late 19th century. The “bourgeois revolution” was not necessary for Prussia because it was doing well economically. This meant that traditional elites maintained and increased their influence over what was a military and rural society. These elites were referred to as the Junkers: the noble landowners located east of the Elbe River. They fought back against the liberal tendencies in the German south from Bavaria to western Rhineland. The Prussian model, through its traditional and militaristic leadership, slowly allowed intolerance and illiberalism to grow as a means of maintaining power. This “special path” that the Prussian state chose allowed the rise of the Nazi dictatorship and led Winston Churchill to say in 1943 that Prussia “is a source of recurring pestilence.” But the cause of this “pestilence” was actually the political system built by the Junkers, who ran the country prior to the Nazi regime. The Allies dissolved Prussia in 1947, when they signed a law that officially divided Germany into the German Democratic Republic, or East Germany, and the Federal Republic of Germany, or West Germany. East Germany was a Soviet satellite state during the Cold War. Similar to other states in the Eastern Bloc, East Germany was governed by its version of the USSR’s Communist Party – the Socialist Unity Party. It implemented similar economic policies – central planners set prices and the state ran almost all economic activity. West Germany included the three Allied Occupation Zones, held by the U.S., the U.K. and France. The Americans really managed the territories and, as Chancellor Konrad Adenauer took office in 1949, West Germany fully aligned with the West. American funding gave West Germany the ability to recover from World War II and become the world’s third largest economy in just a decade after the end of the war. East Germany was the most successful USSR satellite state, but the standard of living was not comparable. In East Germany, communism replaced fascism – but it didn’t fully eliminate it. Stalin had no reason to do so. In fact, he used it to his advantage. After all, Stalin’s regime was also illiberal and intolerant. Therefore, Moscow encouraged former SS officers to join the Stasi, East Germany’s state security service. The Stasi created an effective network of informants that spied on civilians, with the stated purpose of enforcing the regime’s will. This was completely different than what was going on in West Germany, where the Americans implemented a denazification program to remove remnants of the Nazi regime from public life. While the program was criticized in West Germany for being just a procedure to allow rehabilitation of many Nazi party members, there was no comparable program in the east. West Germany’s success encouraged many East Germans to migrate there. But once the wall went up in 1961, migration from east to west was almost impossible. East Germans believed that the Americans were responsible for closing the borders, which is what the Soviets told them. This added to the German perception that the U.S. was the true victor of the war – it was really the U.S. entering the war that ended it. Soon, it was the Americans who were responsible for the problems in both East Germany and the USSR. The U.S. became the enemy. There was also anger against the Americans in West Germany, where American troops were seen as occupiers – which they were. But for West Germany, regaining economic stability compensated for the loss of independence. The anti-American sentiments in East Germany were also fueled by the country’s militarism, which was mostly left intact during the USSR occupation. East Germany was the root of the Prussian Empire – its army was at the core of the establishment of the German state. East Germans grew accustomed to having a strong military and could not easily accept defeat. The transformation of the army into a border police force and the Stasi compensated somewhat, as East Germany had the largest border guard force of the Eastern Bloc countries (47,000 troops). These differences between East Germany and West Germany are still visible today in a number of ways. First, the idea that Germany needs a powerful military remains a core belief in the east. But the west sees the military more as a security provider and less as an intrinsic part of German culture. Second, anti-American sentiments are still more pronounced in the east than in the west. Third, the east seems as agrarian as it was during the Junkers’ time – something the east holds against the west. The question, then, is what are the political ramifications of these differences? Because of the weaker economy, the gap between the electorate in the east and the mainstream political elite in Berlin existed before the current refugee crisis and the EU financial crisis. The electorate in the east wants Berlin to address its socio-economic problems. But Berlin’s willingness to absorb more migrants, while the east continues to face these challenges, is a source of friction. The Left Party has been a contender for second place in local elections since the 1990s. Since the AfD was founded, it has taken votes away from both mainstream parties, the SPD and Christian Democratic Union, as well as the Left Party. According to a recent poll released by the newspaper Frankfurter Allgemeine Zeitung, the Left Party is the second most favored party for one out of three Germans who vote for AfD. Such political fragmentation can lead to difficulties in governing the country. Alexander Gauland, one of AfD’s leaders, said that cooperation with the Left Party is possible, in particular when it comes to the euro crisis. Both non-mainstream parties have populist platforms and both understand the population’s nostalgia for the past, whether communist or fascist. This is dangerous for Germany, as such tendencies could spread from the east to the national level. Since Germany is at the core of the European Union, such problems could accelerate the EU’s disintegration. The continued transition from communism to a free market economy in the east, coupled with deep differences in mentality between the west and east, are the real challenges facing the elite in Germany. Rising nationalism in Europe is natural considering the socio-economic problems countries are confronting. But in Germany, the divide between the elite and the population is a reflection of the divide between the east and the west. The two regions have different views when it comes to social policies, defense and even Germany’s relationship with the U.S. It was easier to reconcile their positions in times of economic growth – it is difficult to do so when faced with both economic and security problems. Britain’s vote to leave the EU has been the most cataclysmic global political event this year so far. Over the next 12 months, we may see one or more of the following: a victory of Donald Trump in the US; a defeat of Italy’s government in a referendum over constitutional reforms; a Marine Le Pen victory in the French presidential election; a rightwing anti-immigration and anti-euro party becoming Germany’s largest opposition party. Not all these calamities will happen. But one or two might. And to this list one could add a few minor misfortunes, such as the failure of bilateral trade deals between the EU and the US or Canada. The lead-up to the Brexit vote offers four important lessons to those who are fighting the forthcoming campaigns from an establishment position. They matter because some of the mistakes made by the pro-EU camp in the UK are being repeated elsewhere with the same enthusiasm. 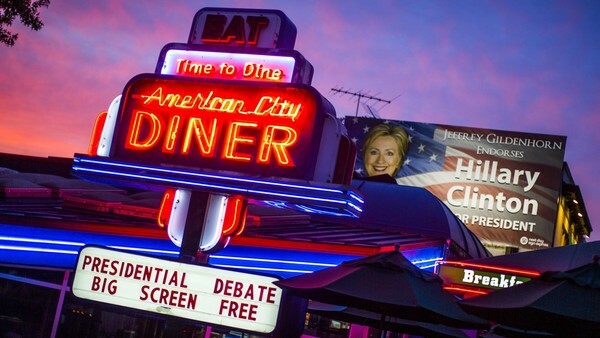 The first is: do not rely on opinion polls or other forms of crystal-ball gazing. The crassness of the pro-Brexit campaign galvanised millions of voters who did not turn out in previous elections. I have been told that US polling techniques are technically superior to those in the UK. Maybe. But if the decisive factor in an election is turnout, then even the best polls cannot be relied upon. The same goes for betting markets. If there is genuine uncertainty, market mechanisms do not produce any information. It just means that more people are getting it wrong. The second lesson is: do not double down. An insurrection of sorts is under way against financial globalisation and its institutions. Real incomes for voters have stagnated in the US and the UK, and also some eurozone countries. People may be wrongly associating the fall in their incomes with a rise in immigration or with trade liberalisation. If you want to dispel these perceptions, you need to do more than pull out studies by liberal economic think-tanks. You should offer credible policies to address the decline in real incomes. The absence of such a promise was a major failing of the pro-EU campaign in the UK. Also beware of provocation. In Europe, where electorates are rebelling against EU integration, make sure that former European Commission presidents do not offer their lobbying services to large US investment banks, as just happened with José Manuel Barroso and Goldman Sachs. The European institutions should leave both parties in no doubt that this arrangement will be to their disadvantage. And finally, do not scare the voters. Project Fear was a disaster in the UK. If your median voter’s income has stagnated for more than a decade, they are not going to be scared by the threat of a recession. Why should a low income earner in the UK worry that the City of London will lose its financial passport? The argument is politically illiterate and economically dubious. When I saw a study claiming that Mr Trump’s trade polices would cause a US recession, my immediate reaction was: oh no, not again. The problem with scare stories is not just that they no longer work with unpredictable electorates. More often than not they are also not true or vastly exaggerated. While the long-run effect of Brexit remains uncertain, the UK economy has so far defied predictions of a deep recession. I suspect the same would be true of a Trump victory, or a triumph of the populist Five Star Movement in Italy. The markets may panic the next day but the economic consequences will depend largely on the subsequent policies. These scare stories have added to a generalised loss of confidence in the economics profession and its reputation of independent judgment. With that loss also goes respect for international institutions such as the OECD and the International Monetary Fund, all willing participants in the anti-Brexit scare. As a result of a collective over-reach, the profession has lost influence in the important current debate of what form Brexit should take. This is now a debate between lawyers and politicians from within the Conservative party. Brexit is a fitting example of the dynamics of electoral insurrections in the north Atlantic democracies. It tells us how fast firmly entrenched establishment positions can crumble and how the improbable becomes the inevitable. The western policy establishment needs to smarten up. Sometimes I wonder if I'm ever going to run out of new things to say about the economy. Nothing interesting has happened in a long time. 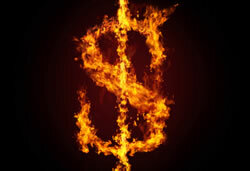 Our liquidity-drunk "markets" remain over-priced due to the chronic intervention of the global central banking cartel, which has demonstrated over and over again that it won't tolerate even the slightest drop in asset prices. Those familiar with my writing know I put the word "markets" in quotes because we no longer have a financial system where legitimate price discovery is a regular -- or even recognizable -- feature. It's been a long 7 years for those of us who believe fundamentals matter. For quite some time they have not. I'm still not able to predict whether we're a week away from this or five years. Such is the uncertain fate of living within a nested set of complex systems run by fallible humans. Though while we cannot predict exactly what will happen, to what degree it will manifest, or precisely when, we can track the 'fingers of instability' in the system and note that these are growing longer, and steeper. For instance, total worldwide debt is more than $60 trillion larger than it was before the 2008 financial crisis. So we can make conclusions like "larger" and "sooner" about the probability of the coming correction. What the central banks claimed they were after - rapid GDP growth, a set rate of inflation and rising incomes - has not materialized in the way they hoped. After more than tripling their collective balance sheets since 2008 (an increase of nearly $12 trillion) to stimulate the world economy, global GDP growth is still stumbling along at an uninspiring 2.5% -- and showing signs of slowing. Well, for starters, they've created the largest wealth and income gaps on record, over-inflating financial assets and creating conditions ripe for aggressive financial engineering by corporations, both of which reward the top 1% preferentially. The top 1% has gotten all the gains in each of these bubbles. The only defense the Fed has is to claim that "Well, things would have been even worse for the lower 99% if we had done anything different". But this rings as hollowly as any prove-a-negative defense. We cannot know how things would have been different for the bottom 99% if the Fed had done things differently. But we can know, with 100% certainty, that if the Fed had not dumped money into the financial system and had not targeted rising asset prices that the incomes of the top 1% would not have skyrocketed like this. It's really simple: when you financialize an economy, those with the most direct access to the money in that system -- which is by definition a tiny elite -- are going to benefit the most. And it's not the 1% we're talking about here, but the 0.1%. The more financialized the system, the more highly concentrated the wealth becomes. Given this tremendous [wealth] disparity, I'm reminded that Plutarch once cautioned that an imbalance between rich and poor is the oldest and most fatal ailment of all republics. So what does it mean that 80% of our population possesses a meager 11% of the total wealth? For one thing it means that the recent efforts by the Fed to provide massive amounts of liquidity support to the biggest and wealthiest banks at the inflationary expense of the lower classes were not only misguided, but they were cruel and unusual. FRANKFURT- ”The European Central Bank's massive bond-purchase program and other easy-money policies probably haven't worsened inequality in the eurozone, Germany's Bundesbank said on Monday, hitting back at concerns that central banks are taking on an increasingly political role by redistributing wealth. "It seems very doubtful that [the ECB's] special policy measures of recent years have increased inequality in an overall context," the Bundesbank wrote. I've never wanted to punch a sentence before, but I do now. I can't believe how tone-deaf and utterly disconnected from a very obvious and inarguable reality that last statement by the Bundesbank is. I think I was pushed over the edge by the pedantic and meaningless phrase "in an overall context. "Â I'll get over it. But again, we're supposed to believe that the massive wealth gains of the upper classes are somehow an equal exchange for poor people not losing their jobs? Â The contest is not even close. New figures show that the bonus bonanza of 2013 didn't disappoint. According to the New York State Comptroller's office, Wall Street firms handed out $26.7 billion in bonuses to their 165,200 employees last year, up 15 percent over the previous year. That's their third-largest haul on record. You read that right: just Wall Street's bonuses alone in 2013 were 2x greater than the entire take home pay (pre-tax of course) of every single person in the US working for minimum wage. So it's really rather grotesque and unacceptable for the Bundesbank and Yellen et al to attempt to claim that central bank policies have been equally beneficial to all segments of society when taken in an overall context. No, they most certainly have not. They have been massively and disproportionately unfair and the recent populist uprisings across the globe are proving as much. Central banks, of course, have access to the same wealth charts as everybody else. There's no room for debate on the matter. Financial asset price inflation has preferentially benefitted the very tippy-top of the wealth pyramid and has done so at the expense of the bottom tiers. Monday's report marks the Bundesbank's latest effort to defend the ECB and its independence amid concerns voiced by politicians that years of ultralow interest rates are hurting savers and pensioners. The fact that the central banks are now "defending" their policy framework from any criticism that their policies have been unfair tells us that we are now at Act Two of this drama. Act One involved ignoring the problem and pretending it didn't exist. Act Two is to defend the status quo. We'll know we're at Act Three when they start acknowledging that the problems are real, and that change is needed. Which is why we have a "Fed cred" problem. Our central banking high priests and priestesses have been doing their rain dance for an uncomfortably long time, and awkwardly, there's still no rain. Regular people and the cheerleaders in the mainstream media are beginning to take notice. Look for this unease to grow; it won't be long before you attend a cocktail party and someone pulls you aside to complain about the Federal Reserve's policies. When Will The Next Too Big To Fail Bank Fail? - The next Too Big to Fail (TBTF) bank could fail within three years. - This is the most arresting observation by Natasha Safer and Lawrence Summers in their recent article. - Safer and Summers find the banking system dramatically riskier than do government officials. - This article compares the methods of the two camps and asks why they differ. - The Safer and Summers position is far more persuasive. To listen to President Obama or Fed Chair Yellen, the problem of large bank failures in a liquidity crisis has been brought under the regulator's firm control. Natasha Safer and Lawrence Summers hold an opposing point of view. They suggest the next Too Big to Fail (TBTF) liquidity crisis might be as close as three years away. This article argues that Safer and Summers' approach is both more useful and more accurate than that of the regulators. And, normal humans can understand it. Contrasting Safer and Summers with the regulators. First, both the President and the Chair have views tinged by their current responsibilities within government and regulation. Chair Yellen denied that politics influence Fed monetary policymaking in a news conference this week. Not only is that false, it would be irresponsible of the Fed if it were true. Politics affects and is affected by monetary policy. The two are interdependent. This is not in any way a failing of the Fed. It is simply a statement of the Fed's responsibilities. Lawrence Summers, on the other hand, has moved his headquarters from the Administration to academia. Rarely, however, has a person with such weighty previous responsibilities within government been so thorough in changing perspective. By reading the piece, coauthored by Natasha Safer, Have Big Banks Gotten Safer? analyzing bank regulation, you would have no idea of his past responsibilities. Not so with former Fed Chairman Bernanke, to compare Summers with another giant of the Crisis. Bernanke is still very much former Chairman Bernanke, not yet completely Professor Bernanke. Second, the opinions of regulators and political office-holders, on one hand, and those of Safer and Summers, on the other, are based on entirely different ways of measuring the risks confronted by banks. The President and the Chair are entirely focused on the book values of risky financial instruments and measures of risk provided by apparatchiks such as the rating agencies. There is a nod given to the banks' own statements of their risks. For example, the banks are allowed to provide their own forecasts of losses under duress. But there is evident regulatory skepticism about bank veracity. While I share this skepticism, I am no less skeptical about regulatory veracity. Safer and Summers, in contrast, focus on the measures of risk provided by financial markets. These measures are preferable to book values and agency ratings for important reasons. Market measures of risk are provided by investors, with skin in the game, collectively; not by staff, with no skin in the game, individually. These measures, by virtue of their market location, cannot do what they should not do - divorce the issue of risk from the inseparable issue of profitability. Market measures of safety innately include the direct impact on the banks, both positive and negative, of the decisions of office-holders and regulators. This, politicians and regulators scrupulously avoid. Third, Safer and Summers believe in the value of simplicity in policy. The current regulators are lost deep in the weeds of detail. Government officialdom must legislate and regulate based on reports formed of solid rock, rather than the shifting sands of markets. Nonetheless, in addressing the extremely important question, "Is Dodd Frank delivering greater bank safety?" any source of information, particularly if that source is more likely accurate than reports provided to regulators, ought to be carefully considered in deciding how to proceed with bank regulation. The bottom line on the difference between market measures of bank safety and soundness is provided by Haldane and Madouros' delightful " The Dog and the Frisbee." This is a "must read" by two economists at the Fed, but located in the "show me" state where heretics are safer than those located in the belly of the beast, Washington D.C. Safer and Summers explain the point thus: "[Haldane and Madouros] note that in a horse-race between the simplest market measure of risk (the market value of equity relative to unweighted assets) and the most complex regulatory measure (the Basel Tier 1 ratio), the explanatory power of the simple measure in predicting bank failure is about 10 times greater than the complex one." I reaffirmed several of my prior beliefs from analyzing Safer and Summers' work. Bank regulation is far too complicated. Both Safer and Summers, and Haldane and Madouros, provide thoroughly convincing arguments that bank regulation is lost in a welter of unnecessary complexity. Between the Fed's Comprehensive Capital Analysis and Review (CCAR), the requirement that TBTF institutions submit "living wills," and the capricious manner in which both sets of regulations are enforced and evaluated, billions are wasted by both regulators in banks in the name of appearing to be thorough. The rules are not thorough; they are obscure, and of marginal relevance. The OTC dealer banks have contributed in a major way to their own comeuppance. They have built their oligopolistic prison brick by brick. That the government is institutionalizing the big bank's irrelevance is only a second drink at the trough of foolish avarice. Our financial system outside the banks is still highly vibrant and creative. As Safer and Summers indicate, the share of the financial intermediation outside the banks is growing as the share inside the business declines. Various measures of the relative market volatility of bank liabilities and equity relative to those measures before the crisis. The ratio of the market value of equity to bank assets at the major banks, Bank of America (NYSE:BAC), Citigroup (NYSE:C), Goldman Sachs (NYSE:GS), JP Morgan Chase (NYSE:JPM), Morgan Stanley (NYSE:MS), and Wells Fargo (NYSE:WFC), have fallen dramatically as demonstrated by the graph below. Forward-looking measures of the relative volatility of bank equity embedded in options prices. The evolution of the bank's equity betas since the crisis. The riskiness of bank wholesale secondary market liabilities, as measured by credit default swap spreads. Preferred stock prices and yields. 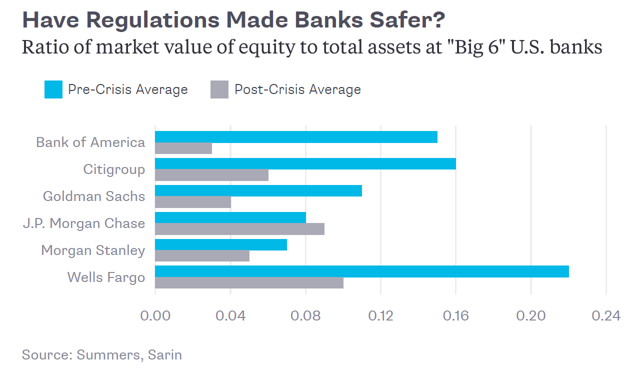 Safer and Summers find that all these measures provide evidence that every form of claim on bank assets and income is riskier relative to market measures of performance now than during the period preceding the crisis. Regulations have cut the banks off from their pursuit of the technologically inevitable course of future finance - servicing of the needs of corporations that are moving away from primary financing toward secondary financing. Though discouraging asset-lite activities such as primary market issuance, secondary market trading, and merchant banking; regulators have sent banking back to an obsolete past. Regulators are denying the banks the ability to adapt to the changing structure of non-bank corporate risk-taking: more smaller and newer ventures; fewer bigger established ventures. Big banks and their big customers begin to look more and more like dinosaurs. In today's essay, Agora founder Bill Bonner explains why the biggest threat to your wealth, well-being, and liberty isn't a foreign enemy or terrorist. Elizabeth received a strange letter from her congressman. But wait, he didn’t name the enemies. That left us wondering: Who are our enemies? Muslims, Jews, Arabs… Russians, Iranians, North Koreans… capitalists, the Deep State, Yankees… liberals, conservatives? And what does he mean by “our”? A politician’s enemies are more likely to be our friends than our enemies. Our most dangerous enemies could be the feds themselves! But people love simple and preposterous lies. They much prefer them to the truth. Truth is elusive. Difficult to discover. Infinitely nuanced. Hard to hold onto. Each tiny bit of truth comes at a high price: A love lost. A marriage ruined. A business bankrupt. Money wasted. And a sorry soul burning on some ash pit in Hell. Nor does truth make you feel good. Like a magnifying mirror, it shows blemishes. You squirm in your seat when you see it. Often, you want to turn off the lights. Not so with myth. It comes right over to you, fawns over you, airbrushes your photo, and Botoxes your face. It flatters you with weak light and strong angles. It pretends you are the noble master and it is merely the humble slave… willing to do your bidding. Today and tomorrow, we will look at popular myths. The myth of the “enemy” is always a hit with the masses. Politicians love it, too. It encourages taxpayers to turn over more of their wages – for their own protection, of course. It invites citizens to give up their liberties – in this time of grave danger! It rousts up the population to think and act with a single mind… united to meet the common foe, under the brave and unflinching leadership of our patriotic politicians. And woe to the person who resists. He is “soft” on our enemies. Or an outright traitor. If you believe the polls, millions of Americans will choose their next president based on which one will do a better job of protecting them from terrorists. Apparently, terrorists – particularly foreign-born terrorists – pose a substantial threat. It is time that equality bore its scythe above all heads. It is time to horrify all the conspirators. So legislators, place Terror on the order of the day! Let us be in revolution, because everywhere counter-revolution is being woven by our enemies. The blade of the law should hover over all the guilty. There are always people who are willing to use violence in pursuit of political ends. After all, that’s the name of the game. If no violence were involved, it would be no different from the rest of life – with its give and take, its persuasion, its bargaining, its negotiating, and its civilized commerce. Without violence, a meeting of the Committee of Public Safety in 1793, or a Joint Session of Congress in 2016, would have no more importance than, say, a gathering of the Kiwanis Club or Elvis impersonators. Politics is different. The politician – no matter how mild-mannered – always has a loaded gun in his britches. The terrorist merely brings it out and waves it around. From Zionist zealots in Judea… to the Sons of Liberty in Boston… to Irish irredentists blowing up London subway stops… to the KKK in the South after the War Between the States. In 1920, the IRA attacked over 300 police stations – symbols of British rule – and killed a dozen policemen. They also burned down the docks at Liverpool. In 1946, the Irgun blew up the King David Hotel, killing 91 people. The head of the group, Menachem Begin, went on to become prime minister of Israel. Germany’s Red Army Faction launched 296 bomb attacks – in addition to assassinations, kidnappings, arson, bank robberies, and shootouts with the police. But wait. What’s this? What about all those millions of terrorists who want to attack us? Are these foreigners really worth worrying about? In a new analysis I just published at the Cato Institute, I look at every single terrorist attack committed on U.S. soil by an immigrant or tourist from 1975 to the end of 2015 and apply some basic risk analysis. Turns out, Americans should not be so worried: The chance of being killed in a terrorist attack committed by a foreigner is about 1 in 3.6 million per year. And the numbers are skewed by one outlier event – 9/11. That single attack accounts for 98.6% of all the people killed on U.S. soil by foreign-born terrorists in the past 41 years. It’s hard to believe there aren’t greater threats lurking somewhere else.